The Blog That Time Forgot: The Adventures of Saint Andrew, Part Seven: "This Day A Martyr or a Conqueror!" The Thracians bursting into Mycalessus sacked the houses and temples, and butchered the inhabitants, sparing neither youth nor age, but killing all they fell in with, one after the other, children and women, and even beasts of burden, and whatever other living creatures they saw; the Thracian race, like the bloodiest of the barbarians, being even more so when it has nothing to fear. Everywhere confusion reigned and death in all its shapes; and in particular they attacked a boys' school, the largest that there was in the place, into which the children had just gone, and massacred them all. In short, the disaster falling upon the whole town was unsurpassed in magnitude, and unapproached by any in suddenness and in horror. 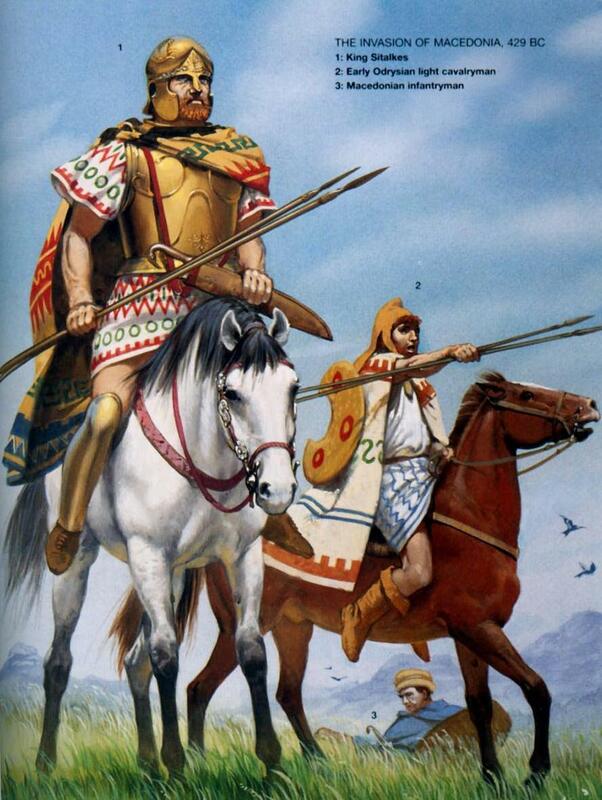 The Thracians who live above the Crestonaeans observe the following customs. Each man among them has several wives; and no sooner does a man die than a sharp contest ensues among the wives upon the question which of them all the husband loved most tenderly; the friends of each eagerly plead on her behalf, and she to whom the honour is adjudged, after receiving the praises both of men and women, is slain over the grave by the hand of her next of kin, and then buried with her husband. The others are sorely grieved, for nothing is considered such a disgrace. On that day there fell on the side of the Romans 200 cavalry and not less than 2000 infantry; about 600 were made prisoners. Out of the king's army 20 cavalry and 40 infantry were killed. 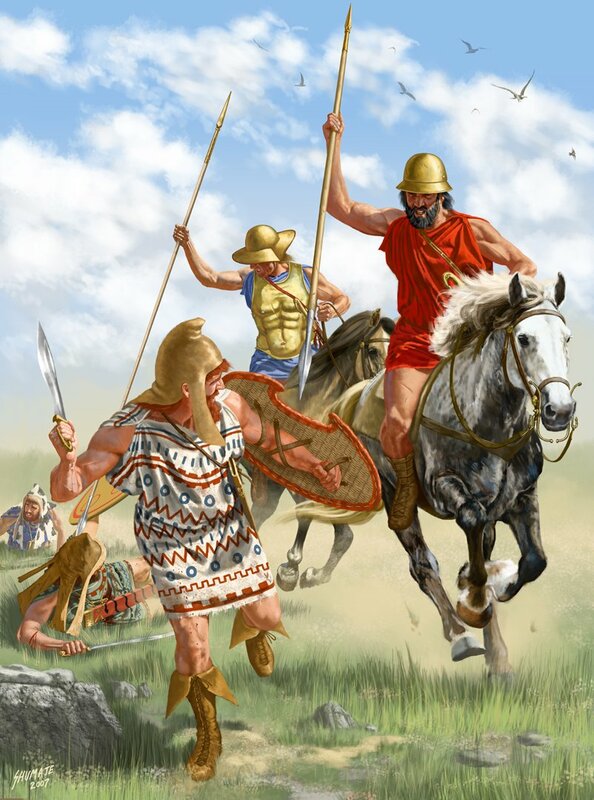 On their return to camp the victors were all in high spirits, but the Thracians surpassed all in the insolence of their joy. 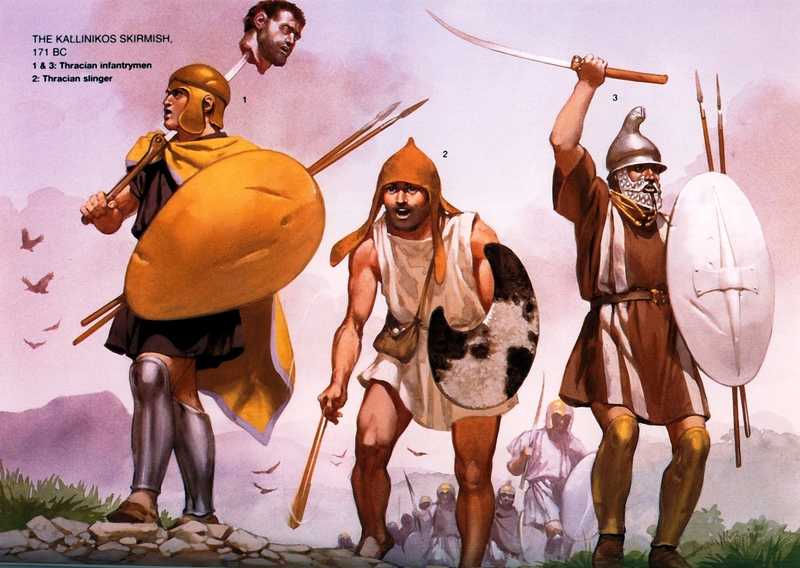 They returned to camp singing and carrying the heads of their enemies fixed on their spears. 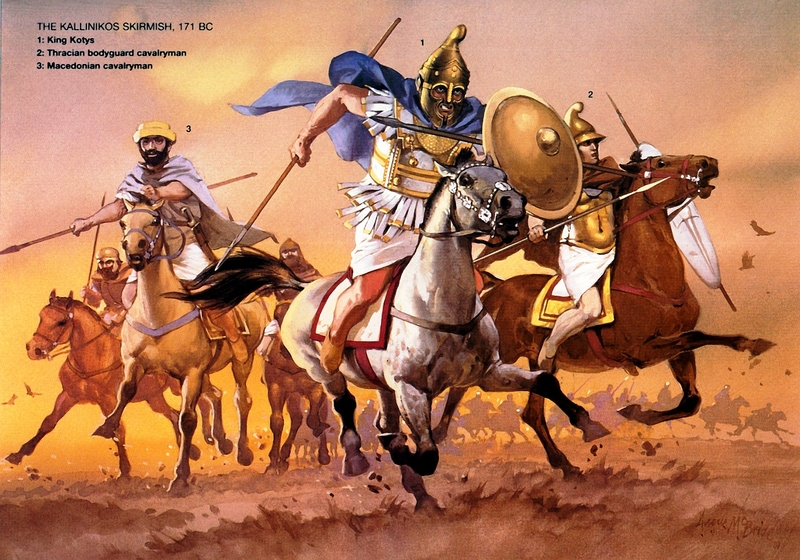 A race of extravagant, drunken, uninhibited, bloodthirsty barbarians? Sounds like my kind of people just the sort of wayward souls who need Christ in their lives! How St Andrew, the Champion of Scotland, Travelled into a Vale of Walking Spirits, and how he was set at Liberty by a going Fire, after his Journey into Thracia, where he recovered the Six Ladies to their natural shapes, that had lived seven years in the likeness of milk-white Swans, with other Accidents that be∣fell the most Noble Champion. Well, that doesn't sound so bad: a wee walk among spirits, a journey through Thracia, turning birds that were birds back into birds. Sounds positively quaint. When does the action start? ... At last, without any further molestation, he arrived within the Territories of Thracia, a Country as you have heard in the former Chapter, adorned with the beauty of many fair Woods and Forests, through which he Travelled with small rest, and less sleep, till he came to the foot of the Mountain, whereupon stood the Castle wherein the woeful King of Thracia, in company of his sorrowful Subjects, still lamented the unhappy Destinies of his six Daughters turned into Swans, having Crowns of Gold about their Necks; when the Valiant Champion St. Andrew beheld the lofty situation of the Castle, and the invincible strength it seemed to be of, he expected some strange Adventure to befall him in the said Castle, so preparing his Sword in readiness, and buckling close his Armour, which was a shirt of Silver Mail for lightness in Travel, he climbed the Mountain, whereupon he espied the Gyant lying upon a craggy Rock, with his Limbs and Members all rent and torn, by the fury of hunger-starved Fowls: which loathsome Spectacle was no little wonder to the worthy Champion, considering the mighty stature and bigness of the Gyant: where leaving his putrefied Body to the Winds, he approached the Gates: where after he had read the Superscription over the same, without any interruption, entered the Castle, whence he expected a fierce encounter by some Knight that should have defended the same; but all things fell out contrary to his imagination, for after he had found many a strange novelty and hidden secret closed in the same, he chanced at last to come where the Thracians duly observed their ceremonious Mournings, which in this order were daily performed: First upon Sundays, which in that Country is the first day in the Week, all the Thracians attired themselves after the manner of Bacchus's Priests, and burned persumed Incense, with sweet Arabian Frankincense upon a Religious Shrine, which they offered to the Sun as chief Governor of that day, thinking Page [unnumbered] thereby to appease the angry Destinies, and to recover the unhappy Ladies to their former shapes: upon Mondays, clad in Garments after the Silvans, a colour like to the Waves of the Sea, they offered up their tears to the Moon, being the guider and Mistriss of that day: Upon Tuesdays like Souldiers trailing their banners in the Dust, and Drums sounding sad and doleful melody, in sign of Discontent, they committed their procéedings to the pleasures of Mars, being Ruler and Guider of that Day; Upon Wednesday like Scholars unto Mercury: Upon Thursday like Potentates, to Love; Upon Frydays like Lovers with sweet sounding Musick to Venus; and upon Saturday like manual professors, to the angry and discontented Saturn. Thus the woeful Thracian King, and his sorrowful Subjects, consumed seven Months away, one while accursing Fortune of despite, another while the Heavens of Injustice: the one for his Children's Transformations, the other for their long limited Punishments. But at last when the Scottish Champion heard what bitter moan the Thracians made about the River, he demanded the cause, and to what purpose they observed such Ceremonies, condemning the Majesty of Jehovah, and only Worshipping but outward and vain Gods: to whom the King, after a few sad tears Tears strained from the Conduits of his aged Eyes, Replied in this manner. "Most Noble Knight, for so you seem by your gesture and other outward appearance, (quoth the King,) if you desire to know the cause of our continual grief, prepare your ears to hear a Tragick and woeful tale, whereat methinks I see the Elements begin to mourn, and cover their azured countenance with fable Clouds: These Milk-white Swans you see, whose Necks are beautified with Golden Crowns, are my six natural Daughters, transformed into this Swan-like Substance, by the appointment of the Gods: for of late this Castle was kept by a cruel Gyant, named Blanderon, who by violence would have Ravished them, but the Heavens to preserve their Chastities, prevented his Lustful Desires: and transformed their beautiful bodies to these milk-white Swans: and now seven years the cheerful Spring hath renewed the Earth with a Summer's Livery, and seven times the nipping Winter Frosts have bereaved the Trees of Leaf and Bud, since first my Daughters lost their Virgin-shapes: seven Summers have they swam upon this Crystal Stream, where instead of Rich Attire, and embroidered Vestments, their smooth Silver-coloured Feathers adorn their comely Bodies: Princely Palaces, wherein they were wont, like tripping Sea-Nymphs, to dance their measures up and Page [unnumbered] down, are now exchanged into cold streams of water: where in their chiefest melody is the murmuring of cold liquid bubbles, and their joyful pleasure to hear the harmony of humming Bees which some Poets call the Muses Birds." "Thus have you heard" (most worthy Knight) "the woeful Tragedy of my Daughters, for whose sakes I will spend the remnant of my days heavily, complaining of their long appointed Punishments, about the Banks of this unhappy River." Which sad Discourse was no sooner ended, but the Scottish Knight (having a mind furnished with all Princely thoughts, and a tongue washt in the Fountain of Eloquence) thus replied, to the comfort and great rejoicing of the Company. "Most Noble King" (quoth the Champion) "your heavy and dolorous discourse hath constrained my heart to a wonderful Passion and compelled my very soul to rue your Daughters miseries: But yet a greater grief and deeper sorrow than that, hath taken possession of my breast, whereof my eyes have been witnesses, and my ears unhappy hearers of your misbelief, I mean your unchristian Faith: For I have seen since my first arrival into this same Castle, your Prophane and Vain Worship of strange and false Gods, as of Phoebus, Luna, Mars, Mercury, and such like Poetical Names, which the Majesty of high Jehovah utterly contemns." "But Magnificent Governor of Thracia, if you seek to recover your Daughters by humble Prayer, and to obtain your soul's content by true tears, you must abandon all such vain Ceremonies, and with true Humility believe in the Christian's God, which is the God of Wonders, and chief Commander of the rouling Elements, in whose Quarrel this unconquered Arm, and this undaunted Heart of mine shall fight: and how be it known to thee, great King of Thrace, that I am a Christian Champion, by Birth a Knight of Scotland, bearing my Country's Arms upon my Breast," (for indeed thereon he bore a Silver Cross, set in blue Silk) "and therefore in the honour of Christendom, I Challenge forth the proudest Knight at Arms, against whom I will maintain that our God is the true God, and the rest fantastical and vain Ceremonies." Which sudden and unexpected Challenge, so daunted the Thracian Champions, that they stood amazed for a time, gazing upon one another, like Men dropt from the Clouds: but at fast consulting together, how the Challenge of the strange Knight was to the dishonour of their Country, and utter scandal of all Knightly Dignity; they with a general consent craved leave of the King, that the Challenge might be taken, who as willingly condescended as they demanded. So both time and place was appointed, which was the next morning following, by the King's Commandment, upon a large and plain Meadow close by the River-side, whereon the six Swans were swimming, whereupon after the Christian Champion had cast down his steely Gauntlet, and the Thracian Knight accepted thereof, every one departed for that night, the Challenger to the East-side of the Castle to his Lodging, and the Defendants to the West, where they slept quietly till the next morning, who by the break of day, were wakened by a Herald of Arms: but all the passed night, our Scottish Champion never entertained one motion of rest, but busied himself in trimming his Horse, buckling on his Armour, lacing on his Burgonet, and making prayers to the Divine Majesty of God, for the Conquest and Victory, till the Morning's beauty chased away the darkness of the Night, and no sooner were the Windows of the day full opened, but the Valiant and Noble-minded Champion of Christendom entrred the List, where the King in company of the Thracian Lords was present to behold the Combat: and so after St. Andrew had twice or thrice traced his Horse up and down the Lists, bravely flourishing his Launce, at the top whereof hung a Pendant of Gold, whose Poesie was thus written in Silver Letters, "This day a Martyr or a Conqueror." Then entered a Knight in exceeding bright Armour, mounted upon a Courser as white as the Northern Snow, whose Caparison was of the colour of the Elements, betwixt whom was a fierce Encounter: but the Thracian had the Foil and with disgrace departed the List. Then secondly, entered another Knight in Armour, varnished with green Varnish, his Steed of the colour of an Iron-grey: who likewise had the repulse by the worthy Christian. Thirdly, Entered a Knight in a black Corselet, mounted upon a big-boned Paltry, covered with a veil of sable Silk, in his hand he bore a Launce nailed round about with plates of Steel: which Knight amongst the Thracians was accounted the strongest in the World, except it were those Gyants that descended from a monstrous Lineage: but no sooner encountered these hardy Champions, but their Lances shivered in sunder, and flew so violently into the Air, that it much amazed the beholders, then they alighted from their Steeds, and so valiantly bestirred them with their keen Falchions, that the fiery sparkles flew so fierce from these Noble Champions steely Helmets, as from an Iron Anvil: But the Combat endured not very long, before the most hardy Scottish Knight espied an advantage, wherein he might shew his matchless Fortitude: whereupon he struck such a mighty Blow upon the Thracian's Burgonet, that it cleaved his head just down to his shoulders: whereat the King suddenly started from his Seat, and with a wrathful countenance threatened the Champions Death in this manner. "Proud Christian" (said the King) "thou shalt repent his death, and curse the time that ever thou camest to Thracia: his blood we will revenge upon thy head, and quit thy committed cruelty with a sudden death:" and so in company of a hundred Armed Knights, he encompassed the Scottish Champion, intending by multitudes to murder him. But when the valiant Knight St. Andrew saw how he was suppressed by Treachery, and environed with mighty Troops, he called to Heaven for succour, and animated himself by these words of encouragement: "Now for the honour of Christendom, This day a Martyr or a Conqueror! ": and therewithal he so Valiantly behaved himself with his Cuttle-Axe, that he made Lanes of murdered Men, and felled them down by multitudes like as the Harvest men do mow down Ears of ripened Corn, whereby they fell before his face like leaves, from trees when the Summer's Pride declines her Glory. So at the last after much bloodshed, the Thracian King was compelled to yield to the Scottish Champion's Mercy, who swore him for the safety of his Life, to forsake his profane Religion, and become a Christian, whose living true God the Thracian King vowed for evermore to Worship, and thereupon he kissed the Champion's Sword. This Conversion of the Pagan King, so pleased the Majesty of God, that he presently gave end to his Daughters punishments, and turned the Ladies to their former shapes. But when the King beheld their smooth Feathers, which were as white as Lilies, exchanged to natural fairness, and that their black Bills and slender Necks were converted to their first created Beauty (where for external fairness the Queen of Love might build her Paradise) he bad adieu to his grief and long continued sorrows, protesting ever after to continue a true Christian for the Scottish Champion's sake, by whom and by whose Divine Orisons, his Daughters obtained their former Features; so taking the Christian Knight in company of the six Ladies, to an excellent Rich Chamber prepared with all things according to their wishes, where first the Christian Knight was unarmed, then his wounds washed with Whitewine, new Milk, and Rose-water, and so after some dainty Repast, conveyed to his nights Repose. The Ladies being the joyfullest Creatures under Heaven, never entertained one thought of sleep, but passed the night in their Father's company, (whose mind was ravished with unspeakable pleasures) till the morning's messengers bad them good morrow. Thus all things being prepared in a readiness, they departed the Castle, not like Mourners to a heavy Funeral, but in triumphing manner, marching back to the Thracian Palace, with streaming Banners in the Wind, Drums and Trumpets sounding joyful Melody, and with sweet inspiring Music, caused the Air to resound with Harmony: But no sooner were they entered the Palace which was in distance from the Gyant's Castle, some ten miles, but their Triumphs turned to exceeding Sorrow, for Rosalinde with the Champion of Italy, as you have heard before, was departed the Court; which unexpected news so daunted the whole company, but especially the King, that the Triumphs for that time were deferred, and Messengers were dispatched in pursuit of the Adventurous Italian, and lovely Rosalinde. Likewise when St. Andrew of Scotland had intelligence how it was one of those Knights which was Imprisoned with him under the wicked Enchantress Kalyb, as you heard in the first beginning of the History, his heart thirsted for his most honourable company, and his eyes seldom closed quietly, nor took any rest, untill he was likewise departed in the pursuit of his sworn Friend, which was the next night following, without making any acquainted with his intent: Likewise when the six Ladies understood the secret departure of the Scottish Champion, whom they asserted dearer than any Knight in the World, they stored themselves with sufficient Treasure, and by stealth took their Journeys from their Father's Palace, intending either to find out the Victorious and approved Knight of Scotland, or to end their Lives in some Foreign Region. The Rumour of whose Departure, no sooner came to the King's Ears, but he purposed the like Travel, either to obtain the sight of his Daughters again, or to make his Tomb beyond the circuit of the Sun. So attiring himself in homely Russet, like a Pilgrim, with an Ebon staff in his hand, tipt with Silver, took his Journey all unknown from his Palace, whose sudden and secret departure struck such an extreme and intolerable heaviness in the Court, that the Palace Gates, were fealed up with sable mourning-cloth, the Thracian Lords exempted all pleasure, and like Flocks of sheep strayed up and down without Shepherds, the Ladies and Courtly Gentiles sate sighing in their private Chambers: where we will leave them for this time, and speak of the success of the other Champions, and how Fortune smiled on their Adventurous Proceedings. Andrew the Valiant made his way to Thracia, where where the corpse of a Gyant lay in a field outside a castle. This giant, Blanderon, planned to capture six Thracian princesses: to evade capture, the Gods transformed the women into swans. (It isn't explained how Blanderon died, but we can imagine the wrathful Thracians had something to do with it). Upon entering the castle, Andrew the Brave saw the decadent heathen rites the Thracians undertook in an attempt to appease the Gods: he clearly felt that only by converting to Christianity could the maidens be restored to their humanity. But somewhat uncharacteristically for the gentle Andrew the Apostle, he did this by challenging the Thracians to a duel. Scandalised by this slight against their nation and religion, the Thracians implored the king to take up this interloper's challenge. Andrew the Destroyer defeated three Thracian champions, including one that was a descendent of giants - which he slew by literally cleaving his skull in twain, in true Conan the Barbarian style. The outraged Thracian king refused to honour this knightly challenge, and sent forth a hundred Thracian soldiers to slay the Scotsman - for in this story, Andrew the Indomitable is a Scot. Yet even this was not enough to subdue him: roaring his knightly battle-cry, he reaped a red harvest through the heathen horde, stupefying the Thracian king into submission. The King converted on the spot, the birds were birds again, and Andrew the Conqueror rode on to his next Adventurous Proceedings. Preposterous? Of course. But such wild romances as this, and the mythopoeia of Blind Harry, James MacPherson and Walter Scott, themselves make up part of our cultural history, regardless of their veracity, or even credulity. They show that our heroes were worth making stories about - even anachronistic chivalric escapades. Who's to say Johnson's use of knightly terms - burgonets, corselets, lances, swords, and so forth - are not simply a lack of historical aptitude, in the manner of Renaissance artists depicting Roman soldiers in what was then futuristic 16th-Century plate armour? Even if Andrew himself did not battle Thracian champions in martial combat, perhaps it is simply a more "heroic" embellishment of a more intellectual struggle? Still, it can be fun imagining a more "historical" version of it. The "Gyant's Castle" could be an allusion to the Cyclopean Fortress of Samothrace, with the "Gyant" a Cyclops or Gigante. 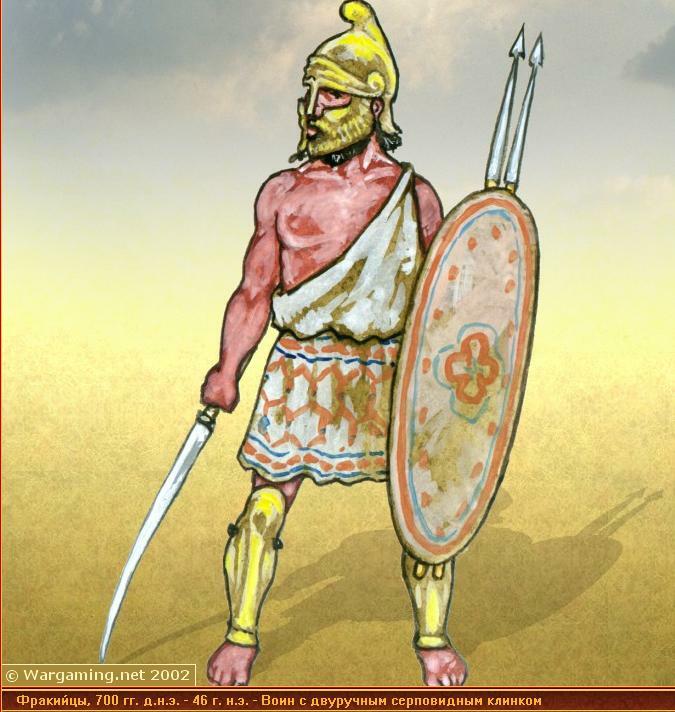 The burgonet could be that snazzy Phyrgian Helm with sculpted moustache & beard; the lance could be a Greek kontos; the colourful armour could be the Greek style. 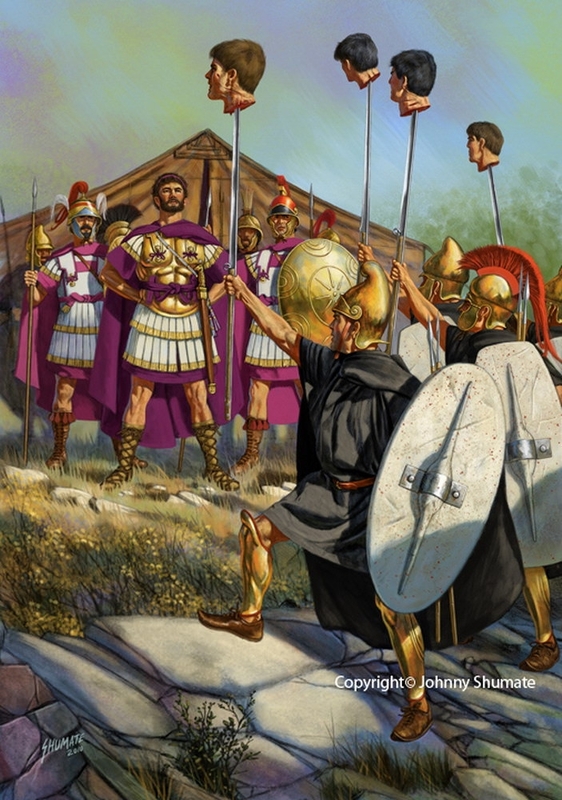 You could even imagine the skull-splitting sword of Andrew as a vicious Falx he borrowed from his Dacian friends!